Graber Pulver Architects was founded in Switzerland in 1992. Since then, the firm has received many international design awards and undertaken numerous individualized projects, including the leopard pit in the Dählhölzli zoo in Berne, the Glarisegg boarding school in Steckborn, and the Rondo apartment house in Zürich. 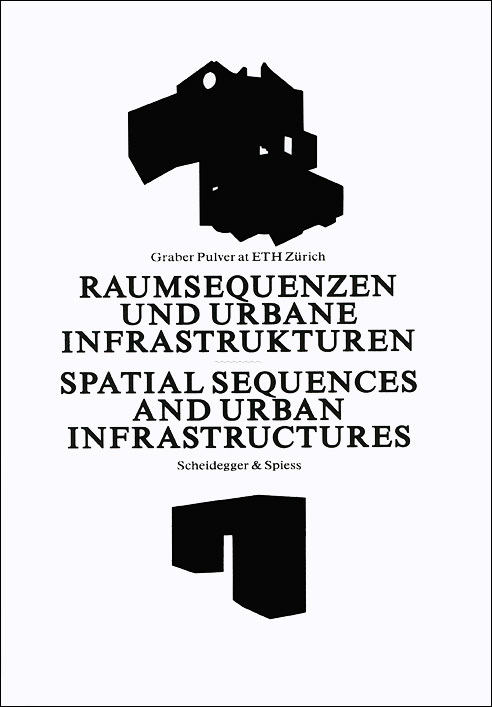 In Spatial Sequences and Urban Infrastructure, the firm’s founders Marco Graber and Thomas Pulver, reflect on their design process and projects and describe how they teach their approach to architectural design to students at the Swiss Federal Institute of Technology. In this book, Graber and Pulver focus on the interaction between the practical application of architecture and its methods of instruction. Within any project, Graber and Pulver understand design as a process that includes the development of both the intellectual concept and the sensual dimension of the structure. Their unique working methods focus on the intersection of infrastructure and the demands of form, as well as the judgment of a structure that is developed by inhabiting and moving within it. Graber and Pulver also show these methods at work, using examples from student projects, accompanied by essays that investigate the students’ tasks and approaches. Spatial Sequences and Urban Infrastructure will be a fascinating contribution to the ongoing dialogue about architectural theory and its application. Parking Structure or Park Structure?